It’s apt that as we go back to school, my first blog of the new term is about a non-fiction book that is laid out in the style of a three term learning process – a school of art. 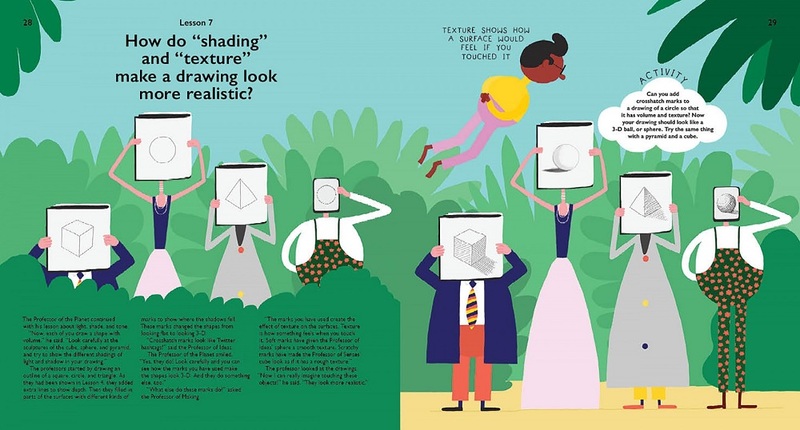 Wide Eyed Publishing have published a unique teaching tool for young readers, which explores basic principles of art in a refreshingly clean, tidy and easy to understand way. 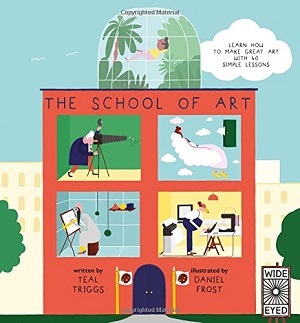 The School of Art by Teal Triggs, illustrated by Daniel Frost, isn’t like previous art titles I’ve reviewed in which a child is shown how to draw an object or character line by line. It isn’t presented, as many children’s art books are, almost recipe style, in presenting a craft idea and showing step-by-step how to create it. This is very different. It aims to teach the tools behind the art so that a reader goes away completely equipped with a skillset, and most importantly, an understanding of art. And yet it still remains incredibly child-friendly. At first glance, the title is rather staid, The School of Art, and the contents page almost academic and rather daunting. The first few pages introduce five imaginary professors, who are going to teach throughout the book, but the bulk of the book is split into three terms of learning – each double page spread, or in some cases individual pages, assigned a different lesson. The contents page is text heavy, as is the introduction. As first impressions go, this reviewer was reluctant to plough through the book. Yet on closer inspection, perversely the detail serves the purpose of making the lessons simpler, like a Chagall painting that tells a narrative, the details of the individual sections pull together to give a wonderfully rich overarching story. The book aims to teach the principles of art, and does so deftly, clearly and without patronising. If there was ever an advert for the kind of teacher one should have, this is it. Far from ploughing through it, I was motivated throughout reading it and have learnt more about art from this book than any other – in a refreshingly simple way. The five professors represent the five tenets of art – ideas, form, senses, making, and the planet or environment. They are introduced in a particularly child-friendly way, exploring their appearance, their studios, and their character traits. For example, the Professor of Form is illustrated intelligently by Daniel Frost as being composed almost of shapes – a triangular beard, rectangular legs, and with an unmistakeable symmetry. The Professor of Senses is partial to ice creams in pointy sugary cones and the Professor of the Planet’s studio is a greenhouse. The lessons are strikingly simple and yet impart great knowledge, building from complete basics up through to technical applications, but always adding in activities, which are easy to do, and demonstrate the lessons magnificently. Although this is not a history of artists, names of famous artists are dropped in when their work helps to demonstrate a lesson – which all helps to build a rounded knowledge. For example, one of my favourite sections in term one is about colour. The lessons stem from the colour wheel to making colours lighter and darker, to how they work in harmony, to contrast, and then fascinating lessons on seeing colours that aren’t there, when the same colour looks different, and when different colours look the same. Lesson 14 on seeing colours that aren’t there gives a stunningly simply activity – which works magnificently – creating an illusion called an ‘after-image’ by painting a circle with three wedges, red, green and blue – that meet in the middle. The reader is asked to take a long look at the centre, and then look to a white sheet of paper. Which colours do you then see? All the activities that I tried were simple and worked, proving their lesson. The book instructs how art encompasses maths and science, and talks about using art to be useful as well as aesthetic. The illustrations are both informative and witty. The text is far from dry – it is light and entertaining. There’s a glossary of terms at the back, and space to add the reader’s artwork to the final exhibition. Once I started this book, it was utterly compelling. Recommended for all children interested in art from age nine upwards, as well as to all teachers, and educators as a brilliant tool for demonstrating basic art principles in the classroom. 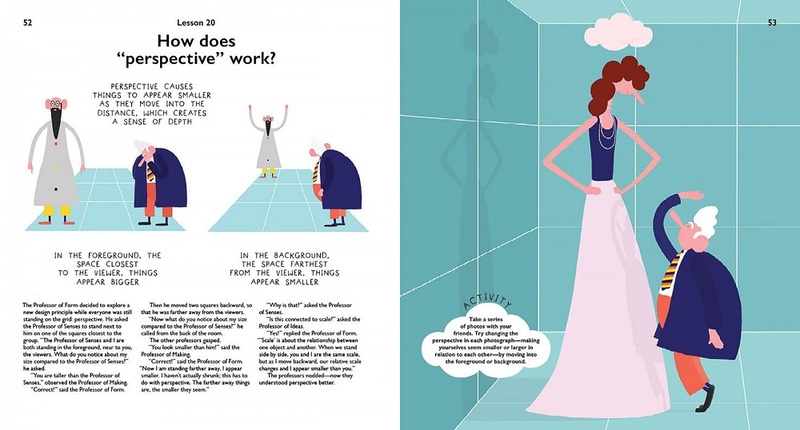 The author and illustrator have dedicated the book to all art and design students everywhere. I would say for those students, it is essential reading, but the author has drawn attention to the fact that the book aims to show the ways in which art can make a difference in people’s lives – adding that it doesn’t matter what age you are for that to be relevant. I would agree – I will be loath to relinquish this book – it’s a surprising masterpiece. It is worth noting that the author is a Professor at the Royal College of Art. I was kindly provided a copy of this book for review from the publishers as part of a mumsnet review panel. To buy a copy of this book from Waterstones, please click here.